This Smoky Harissa Pepper Soup shows how delicious simple ingredients like red bell peppers and tomatoes become when you love them up. This soup takes time, not in the sense that there’s a lot of hands-on cooking. 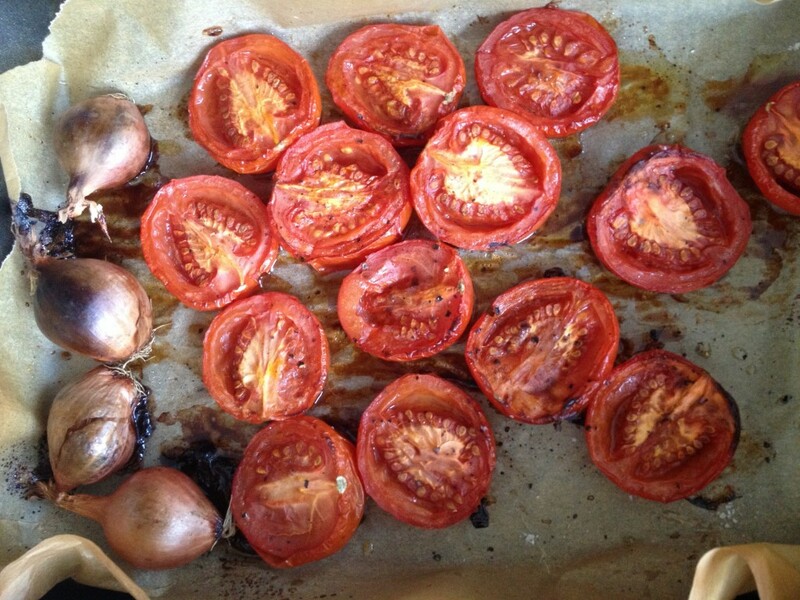 The Roma tomatoes are slow-roasted in the oven until caramelised, sweet and delicious. The red peppers are charred, which gives them a smoky, sweet flavour. Roasted red peppers are a common sight in many tapas bars in Spain and they are truly one of my favourite foods on the planet. This week my thoughts have been wandering off occasionally stirring up my memories of Spain, the blazing hot summer I studied in Madrid, my culinary trip to San Sebastian that same year and my recent visits to Ibiza. Wherever I go, my trips always become a quest for local food. I want to try out new things on my plate to get an understanding of the local cuisine and, more importantly, to understand how people live and what they care about. Food tells a story, and food is such a beautiful way of getting to know a country or person more intimately. Right now I am reading a book about Spain, a book on artisanal cheese making, on living in alignment with nature and the importance of preserving local foods and traditional methods of preparing food. Traditionally, slow-roasting techniques have been used to preserve summer fruits and vegetables. I love ‘real’ sun-dried tomatoes and the fact that you can still enjoy them when summer is over. It adds so much flavour to soups and stews throughout winter. The tomatoes in this soup are oven-roasted but they taste fantastic. Roasting not only helps to preserve vegetables but it also intensifies the taste of vegetables by releasing their natural sugars which gives them a rich and sweet flavour. Something truly magical happens when you roast simple ingredients like garlic, shallots, fennel, eggplant or red peppers. ​Living in a big city, I sometimes long for a slower pace of life, more time for the preparation, preservation and sharing of food. This soup is my way of slowing down, my way of enjoying and appreciating slow food and simple ingredients like tomatoes and bell peppers. I have spend a whole afternoon nourishing this soup, adding a bit of this and a bit of that, thinking about flavours. You don’t have to spend that much time in the kitchen but taking the time to slow-roast the tomatoes and char the peppers will make a huge difference in taste and flavour. I was blown away by the intensity of the flavours as I took my first bite and I loved how all flavours have come together. And the soup tasted even better the next day. While preparing this soup. I accidentally substituted cinnamon for caraway seeds. I was bummed out at first but I ended up enjoying that gentle hint of cinnamon which to my surprise works really well with the spiciness and smokiness of the soup. It transported me right back to Morocco and some of the dishes I enjoyed eating in Ericeira, savoury yet sweet dishes, which combined spices like cinnamon, cumin and coriander. So I’ve decided to keep the cinnamon in. The fresh chili peppers and the blend of spices gives this soup a nice bit of heat. I have decided to call this soup Smoky Harissa Red Pepper Soup as I have combined ingredients that are typically used to make Harissa paste, such as chili, garlic, caraway, coriander and cumin. I have added the smoky Spanish paprika powder and cinnamon. 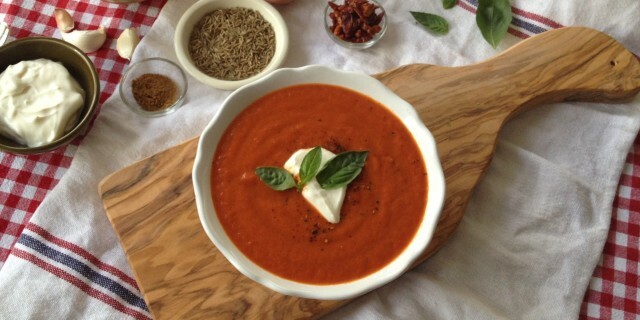 Enjoy this Smoky Harissa Pepper Soup! It’s definitely worth while your time and patience. Line a large baking tray with baking paper and place the shallots (unpeeled) and tomatoes (cut side up) in a single layer on the baking tray. Drizzle with olive oil, pepper and salt. Roast in the oven for 2 hours. Set aside to cool down, remove the the peel of the shallots and chop them up. Char the whole red bell peppers under a hot grill or open glas flame until blackened and the skin starts to peel off. I used the grill of my oven (prre-heated to 225 degrees celsius). I added the whole peppers to a baking tray lined with baking paper and drizzled a little olive oil on top. I roasted them for 15 minutes, turning them around occasionally. When the skin starts to peel off, remove from heat and set aside to cool down. When cool enough to handle, remove the core, seeds and charred skin. Chop up the remaining red pepper. Heat olive oil in a large saucepan. Gently fry the garlic and fresh red chilli for a few minutes. Add the roasted shallots, the roasted peppers, tomato paste and add the chili powder, cumin, oregano and sweet paprika. Fry for 2-3 minutes. Pour in the chopped tomatoes and stock, bring to a boil then simmer the soup gently for about 15mins. If necessary, add more stock. I personally like my soup to quite thick. Add vinegar and use a hand-held blender to blend until the soup is smooth and silky. If necessary, heat up the soup again. Serve with a drizzle of extra virgin olive oil and fresh basil. Season with freshly ground black pepper and salt. If you enjoy dairy, add a nice dollop of sour cream or quark. The soup will also taste delicious chilled, on a hot summer day.